Creating a proper working area in your apartment is a rather troublesome assignment. It might even become a disaster if is not taken seriously. We recommend you start creating a workspace with choosing a perfect location for it. The best idea is to make a separate study room or a library for working. Nevertheless, if the size of your house does not allow such space usage, then you would probably need to find an appropriate computer desk. We offer you a systemized guide to picking the best one for you. First, set the functionality of your future workspace. If you will use it for computer only, than you do not need a huge desk and can save a huge space. Hobbies and paperwork would require a much bigger tabletop, which is why we would recommend you to choose a corner desk or a table with additional rack or drawers for storing all the necessary supplies. As well, decide if you need to keep various office machinery on your desk. It affects the capacity and peculiarities of your potential table (for instance, a presence of system unit rack or a printer stand). After that, choose a basic material for your computer desk. Some of them are solid and bulky while others are sophisticated and elegant. The happy medium for this kind of table is wood. Its sustainability is nearly unlimited; it looks great and has various designs and solutions. We offer you to look through several options here: http://www.furnitureinfashion.net/wooden-computer-desks-c-68_318.html. However, other materials also work for a computer desk. For example, a metal desk would look perfect in a high-tech interior. Plastic desks work for minimalistic apartment designs. Aside from quality characteristics, a basic material choice is all about your personal preferences. While choosing a computer desk, designers and customers often forget about a storage capacity and similar peculiarities. As it has been said before, working usually requires some additional stuff like stationary and office hardware. 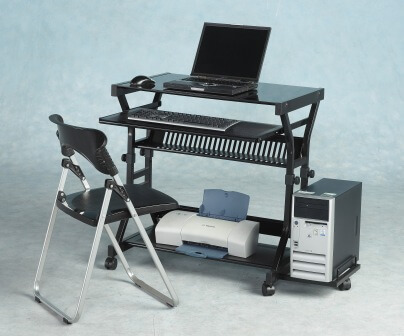 Check out if a chosen computer desk can carry all necessary items and is not totally chocked up. At the same time, do not purchase a huge desk before confirming that an entire tabletop will be used efficiently. Sometimes customers get a bigger desk than they actually need and remain unsatisfied as it clutters up a room, so be attentive and cautious.